I'd heard the idea that you should not grip the bow strongly many times. I had heard my teacher talk about a "soft" right hand. I had watched my teacher's bowing lesson after lesson. But something just wasn't right. 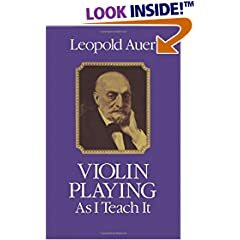 This is a REALLY GOOD book on Violin Technique for Intermediate and Advanced Students. It was written by the man who taught Mischa Elman, Efrem Zimbalist and Jascha Heifetz, so the author knows his subject. Very Good Stocking Stuffer.